Everything at the "Lone Wolf" level, as well as A4 Quest printed edition with 2 brand new, Kickstarter exclusive, adventures and 2 exclusive companions. Now what’s different about Page Quest: Mythical Artifacts? Our idea is to offer you at least a 6-month subscription in which at least once a month (in the first week of the month) you will get an email from us with access to the new game content. In these 6 months you will be reliving with us new adventures in which you will be acquiring new, unique, almost mythical artifacts. Between those adventures we will provide you with written stories to let you know what is happening with our heroes between those adventures. The stories will help you develop your characters and, most importantly, help make decisions that will affect your future encounters in the next episodes. Each episode will fit on one A4 sheet, which can be printed so that you can enjoy the game right away! All you will need to do is pick your hero and arrange a few d6 dice and you are ready to go! There is no cutting involved, so you can play directly on the printed sheet. Although feel free to fold it so that it can fit in your pocket. 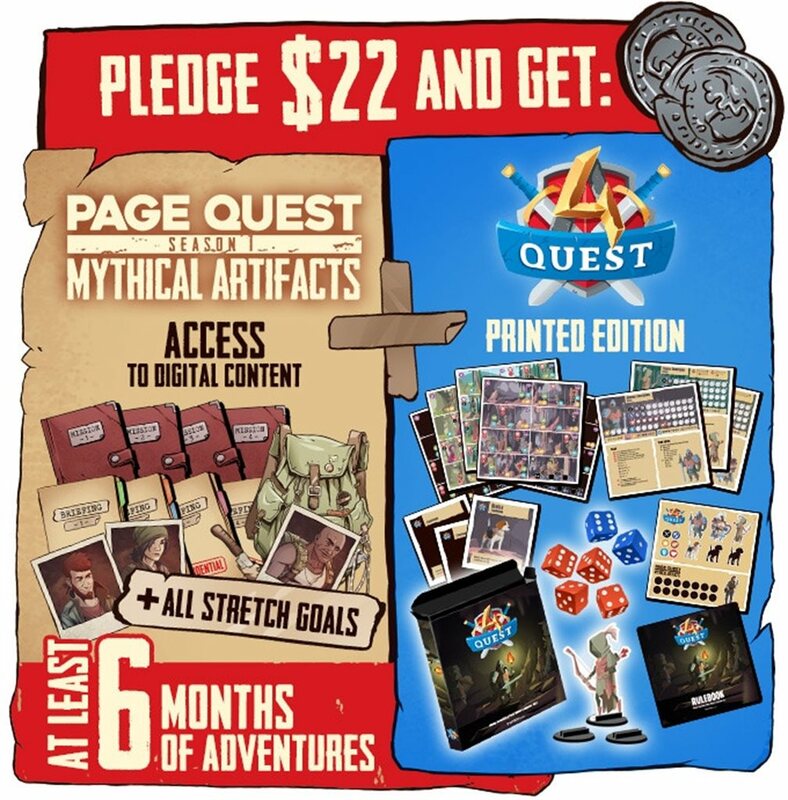 Also if you get the printed version of the A4 Quest, you will be able to use it in Page Quest, so nothing will be needed to be prepared. The first season will take you on a journey around the world in the mid 90’s. Our group of heroes, combined with different individuals like treasure hunters and mercenaries, will explore temples and caves to find new artifacts. They will deal with many threats and face many difficult choices, all in the hopes that they will be able to reveal the mythical mystery behind the artifacts! Getting the 100% milestone will allow us to build up a 4 episode long adventure, which will include everything that is presented in this project. With this campaign we have something unique for you! The briefcase with the interlude for the first adventure or you may call it a prologue for the first adventure, will be presented to you right away after we get the 100% milestone! And then the first episode will be delivered to your emails in the first week after the end of the project - with this approach and the pace we want to thank you for support and your belief in the project. A4 Quest is a solo adventure game in which you will face hordes of monsters while experiencing locations. Your goal is to complete specific tasks while making sure that you stay alive! You have a lunch break during work hours or you’re traveling on a train? Then find yourself some space and go on the adventure to put down some monsters and survive through an epic journey. The whole game has a humorous graphic design and its style resembles a two-dimension platform games known from computers or mobile games. Manage your dice by assigning them to right adventures. Choose from available actions on the field. But remember, you need to plan a few steps ahead! Arrange food so that you can rest, because if you don’t your hero will bite the dust sooner than you think! Also, remember about your hero’s special skills because they might save you more than once!